power : 0.18 -2.2 kw. Head : Up to 34 m.
Flow rate : Up to 250 L/min. 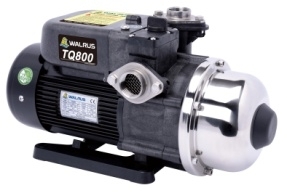 Features: The TQ is a complete, all-in-one unit,consisting of pump, motor, pressure tank and electronic controller. The built-in electronic controller provides constant pressure which ensures that the pump starts automatically.The TQ is constructed from the top quality corrosion resistant materials. The motor has built-in thermal overload to protect against high operating temperatures and over current. Application: The TQ series pumps are designed for water supply and pressure boosting in residential, commercial and light industrial applications where low or inadequate water pressure exists. It is suitable for boosting pressure from underground or surface water supplies.